Hello dear friends! I hope that everyone had a marvelous Christmas and is looking forward to the new year with anticipation! I have loved reading everyone's recap of their 2014. I did a recap last year and enjoyed looking back on the year, but this year is a little different, I don't feel compelled in the least to recap 2014, lol! 2014 was a roller coaster ride for me. The year came and went very quickly, and I can't say I hate it. While 2014 held many beautiful memories, it also held a lot of painful ones too. So, I'm ready for a new slate and a new year...pages of the book that have yet to be written, anxiously awaiting to be filled with stories. There was quite a bit that went undocumented on my blog this year because it was difficult situations to manage every day, much less speak and write about here in this space. Plus, I didn't want to bog my blog down with negativity, but I do feel like it's nice to get it all out there today, remember what 2014 held, and move on from it. One huge thing that you didn't see this year was how much my marriage thrived. 2014 was tough, no matter how you look at it...but my marriage grew so much this year and just speaking on marriage, it was a great year for us. That might sound contradicting to what you'd think when facing an extremely difficult year in every other aspect of our lives, but my goodness, looking back on this year I see my marriage shining in a positive light and I am so, so thankful for that. Josh and I sat down last night to reflect on 2014 and make our goals and resolutions for 2015. The one thing that we kept coming back to is that we really held true to our marriage goals that we set last year and beyond that we treated each other with so much love, honesty, caring hearts and encouragement. I say this so often that everyone is probably tired of hearing me say it but, marry someone you truly, deep down in your heart and soul and mind, absolutely love and who loves you back the exact same. I often describe my marriage to others as magical, but there is a sweet, sweet emotion that fills my marriage every single day. Everyone deserves that, everyone. Looking into 2015 there are bound to be great things ahead. Josh started a new job on Monday, our job as Youth Directors at our church is going great, Murphy fills us with laughs everyday, our families are supportive and loving, we've got our eye on a fun trip we'd like to take this next year, and most of all, just living life everyday with intentional joy. That's our phrase we picked for the year...intentional joy. Thinking about new year fills me with excitement and nervousness. Excitement because of the anticipation and opportunity of a new year and nervous because I don't want to mess it up. Anyone else ever feel that way? When doing my She Reads Truth study this morning, a commenter reminded me that you don't have to do a year perfectly, God's got grace for the imperfect moments. Here we go friends, today we'll wrap up 2014 and tonight we run head first into 2015. I pray that your year of 2015 is outstanding. Filled with many blessings and happiness. Merry Christmas from Colvin & Co.
Hello sweet friends, happy Christmas week! I want to send you many wishes of joy, love, peace, health and happiness to you and yours today. I'll be spending some sweet time with my family in the coming days and hope that you have the opportunity to do the same time. 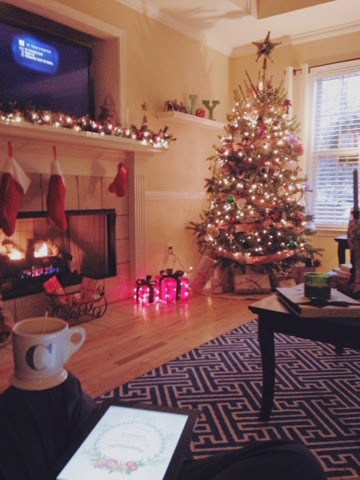 I got up early this morning and was sitting by the fire reading She Reads Truth Advent study. A flood of thoughts filled my mind and I wanted to share those with you this morning. Christmas brings such anticipation. It's more than waiting to open gifts Christmas Eve and Christmas morning, but I'm reminded of the anticipation of Christ's birth. His birth represents so many things, but this year it especially brings to my mind the innocence and new beginning that Jesus brought to this world. He came as a tiny baby and grew up to be that man that saved us all. The story of his birth brings me tears of happiness. For me, many times throughout the year I view the world as a mean, scary place. The news is negative, social media can sometimes be negative, it's a vicious cycle of being sad when I look at the human race. But then...oh but then...I'm reminded that this is my temporary home and that nothing here is permanent. And that's because God sent his Son, the most worthy being to walk the Earth, who was born in a manger...a manger! I'm overwhelmed with joy and happiness when I think about the Christmas story and about how in one moment, when one child came into this Earth through his virgin mother, the world would be changed forever. That we, sinners, would be covered with grace and mercy because of the love the Lord has for us. Talk about a lot of love! I truly can't even wrap my mind around the love that he showers over us, shown by sending his son and then to allow him to die on a cross...all for his people, all for us. For the coming year, I am in desperate need of a new beginning. Of grace, mercy, and the love that Christ brings. 2014 brought a lot of worry, fear, sadness and uncertainty. We're facing our first Christmas without Papa, and undoubtedly it will be a sad and difficult one for all of us. But we'll rejoice in the fact that we'll get to all be together again one day. I'm ready to spend the next few days soaking in my family, the beautiful Christmas decorations that only have a few more days to adorn our home and especially spend time praising God for sending us Jesus. Josh and I (and Murphy!) wish you a very Merry Christmas and a Happy New Year! Thank you for the time you take to come to this little space of mine and read about me and my little family. I hope that you have found encouragement, love and laughter in this space over the last year and I truly hope that you stick around in the coming year and that we can share in new memories together! Happy Monday, friends! It's only 10 days until Christmas, can you believe it? 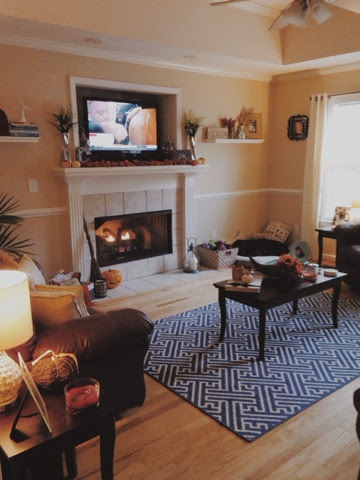 In the spirit of Christmas being next week, I wanted to share our home decorated for the holidays with you!I get so much joy from decorating our house for Christmas. The twinkling lights, the smell of the tree, the ornaments that each have a special meaning, I love it all! I was especially pleased with how the outside of the house of the house came together. Our little stoop looks much better than last year ;) ha! I was a rookie at outside decorations, but this year I had it all figured out. Sort of...haha! In the kitchen it's a little more of a fun and whimsical Christmas feel, which I really like! Mom and I get lucky at craft shows and garage sales when shopping for Christmas decor. I feel like you can always find unique and fun pieces there, rather than run of the mill things that you may find in Target or HomeGoods...not that their Christmas decorations aren't beautiful, but I like to find different things. I'm especially in love with the mistletoe I found at a fun store om introduced me to! The guest room, or more appropriately named, Murphy's room, got a little Christmas lovin' this year with a little tree and I conned Josh into letting me put up one of my Christmas trees from college in our bedroom. At the end of the holiday season, I always get a little sad to put all of our Christmas things away. But I must admit, there is something refreshing about getting your house back in order after the holidays to begin the new year. I'm working from home the better part of this day and it feels good to be able to stay in my PJs a little bit longer this morning and enjoy my desk being set up in the kitchen next to our big window. I can sip my coffee slowly as I take calls and answer emails. I hope you have a great start to your week! 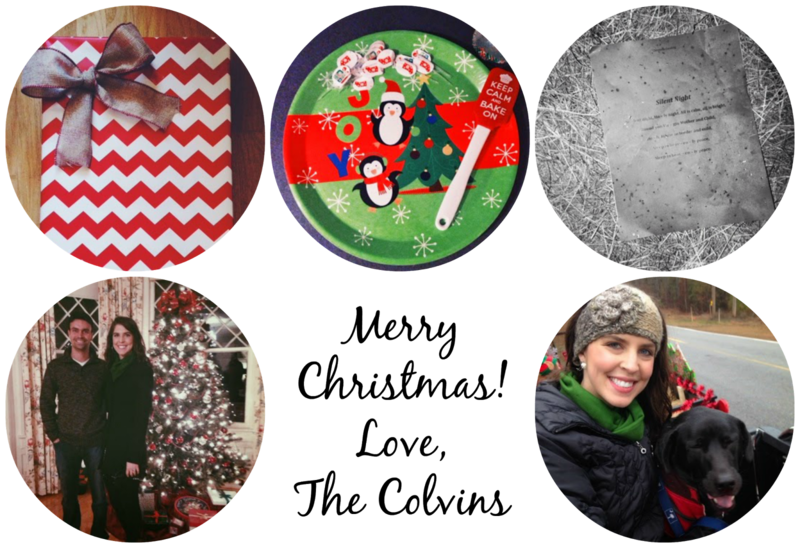 Christmas cards are very close to the top of my favorite things about Christmas! I l o v e searching through card designs, finding the right picture to put in and picking out fun address labels and addressing each one. Most people hate addressing the cards, but I actually really enjoy it. I'm also a big fan of receiving them in the mail! I'm really pleased with how our cards turned out this year! We got pictures taken in late October and when I saw the one that we ended up using on the front of the card, I knew we hit the jackpot. Josh and I were smiling and Murphy was looking right at the camera, bingo! I have to laugh because a few weeks before pictures, Murphy ran through some bushes in the yard and scrapped up his ear, typical Murph move, ha! I would love to see your Christmas cards, leave a link to your post! Sometimes, with the busyness of the holiday season, I find myself using the word "surviving" quite a bit. 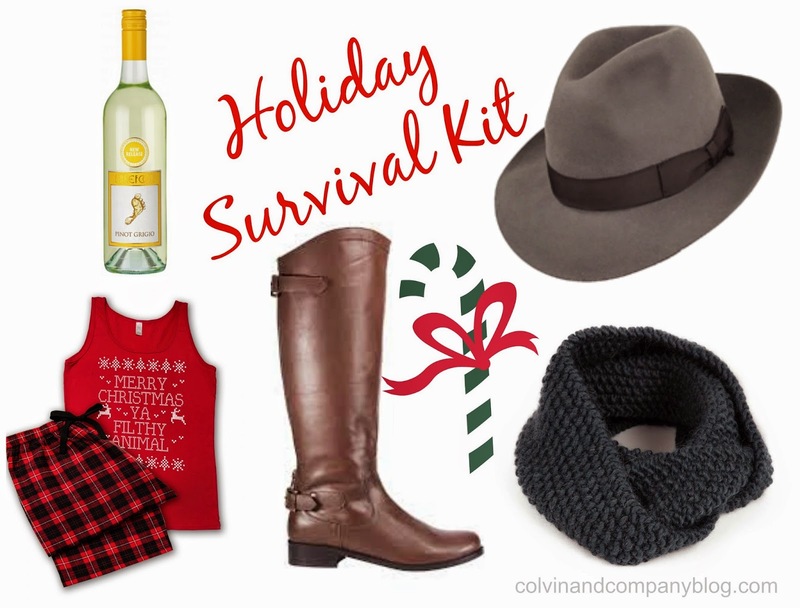 When I think about my Holiday Survival Kit, a few key things come to mind. I used to not be a wine drinker at all, but not anymore! I'm no wine connoisseur, but I have found the few that I like and I so enjoy time spent with friends and family enjoying a glass of wine. Friends are home for the holidays and I love nothing more than meeting at a bar after work or together at each others home for a drink and to laugh and catch up. I love pajamas and especially Christmas pajamas. I just got a new pair from Old Navy when I was Black Friday shopping and I got a sweet pair of slippers from Target that I seriously live in when I'm at home. As soon as I get home from work everyday I jump into a good pair of pajamas! PJs are definitely a necessity at my house! Another no brainer! Almost every weekend when I'm out and about, you'll find me in a fun hat a little jacket or poncho and a big cozy scarf. 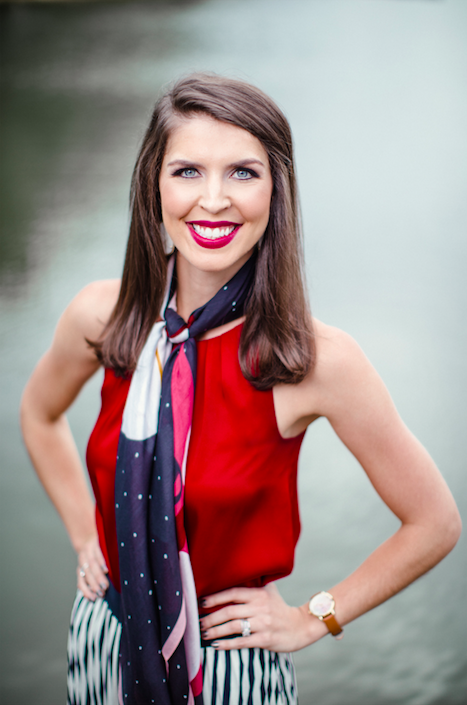 Scarves add so much to any outfit and they are my go-to on the weekends! Sometimes I get home and just leave them on because they keep my neck so warm, ha! When I say I live in hats on the weekend, I totally mean it. I'm such a hat girl. I think they are so fun and bring such a pop of sass and attitude to an outfit. Not to mention, bad hair day? Boom, put a hat on. "We say 'no' to ugly neckties, cologne samplers and executive trinkets. We don't save wrapping paper, we don't do ribbons.We ship bragworthy gifts for guys. Gifts that you can't wait to arrive because you know the recipient will love opening them.Gifts that people gather round at the office, people following the sounds of wood being torn from wood by the included, laser-engraved crowbar.We are Man Crates, and we deliver awesome gifts for men." I hope you're all enjoying the holiday season and eating lots of yummy sweets and drinking lots of yummy things! Happy December 2nd, friends! It's hard to believe it's already December but I'm embracing it with open arms, I love this festive month! We had a great Thanksgiving last week. A lot of good food and a lot of quality family time. We spent time with my mom's side of the family on Wednesday night and had desserts and game night, then Thursday morning we got up and made breakfast and coffee just in time to sit down and enjoy it as the Macy's Thanksgiving Day Parade started. One of my favorite things about Thanksgiving, I love the parade! I literally ate breakfast then danced around the living room the rest of the morning mimicking the Rockettes (love them!) and jamming out the all of the performances. We went to my dad's side in the early afternoon then hit the road to Aiken to spend time with my in-laws. My mother in law had us go around the table and say something we were thankful for and someone we loved about the person sitting to the right of us, I loved hearing everyone's thoughts! We got home that night and loved on Murphy then jumped in bed to gear up for Black Friday. We didn't get up early, I suspect we walked into Target about 10:45 that morning and got home from the mall at 3 that afternoon. That, my friends, is my kind of Black Friday shopping. I only had to get angry at one driver on the road and foot traffic in most of the stores wasn't all that bad ;) We got some great deals and knocked out quite a bit of our Christmas gift list. Mom and I went out on Saturday to finish us some shopping we needed to do together and after hanging with Josh at home for a while Saturday evening, I made a surprise visit to mom and dad's house that night. Sometimes it is so good for the soul to drive back roads, listening to Christmas music, and arriving at your parents house to enjoy some quality time. Coming back to work was hard yesterday morning, ha! I hope y'all had a GREAT Thanksgiving and have a December filled with love and festive things! I finished up our Christmas cards last night and can't wait to get them in the mail this week! After they've had time to arrive at their destinations, I'll post them here! 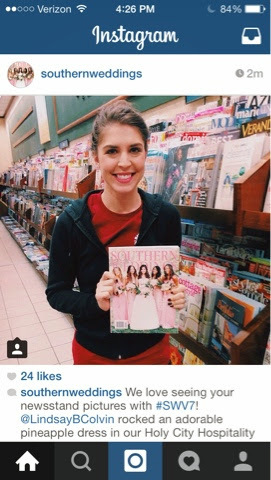 I'd be willing to bet that most of you have not only heard of Southern Weddings magazine, but probably have V7 sitting in your house somewhere. I've been a reader of their website and magazine for quite some time now. And Lara Casey actually came to Columbia for a speaking engagement this summer that I had the opportunity to attend. Which actually lead to my new job...crazy! Back in June, I got to participate in the Holy City editorial that they did in Charleston. It was a beautiful day and it was so fun to watch the behind the scene makings of the shoot. Everyone was so nice and accommodating. Lisa and Emily were the two SW gals that were there for this shoot and it was such a treat to watch them work their magic and see their vision for the magazine truly come to life right before our eyes. The shoot was at the William Aiken House in Charleston and it was a breathtaking venue. I'd passed by it a thousand times when visiting Charleston, but had never been inside until this shoot. The heart of this magazine and the hearts of the ladies behind it, amaze me day in and day out. It's such a blessing to read a positive magazine with positive thoughts about marriage. I love, respect and honor my husband and marriage SO much, that this magazines speaks to my soul and my goal of nurturing my marriage the best that I can. SW gals, thank you for what you do for marriages, The love and support that you give day in and day out, it is so appreciated! This post has been sitting in my drafts for far too long now. So here we go, almost a month later, talking about Murph man's birthday celebration! On Monday, October 27, we celebrated Murphy's second birthday and his one year of adoption! When we adopted him, they weren't sure what his birthday was, so we just decided to make his birthday and adoption day the same. This past year he has brought us SO much joy! Josh has never been a huge animal person like me, but oh my goodness has Murphy been a game changer for that. He loves that little animal so stinking much, just like I do. Murphy has a personality all his own and is so much fun. He loves his toys, handles each one with special care and then rips all the stuffing out ;) He loves to go for walks at the park, car rides, dinner time and whenever someone says "treat!". He can sit, stay and come and listens well...most of the time, ha! He lets me dress him up however I want to and let's me put a coat on him when it's cold out. He loves to snuggle up in the bed with you and if he's really riled up, he'll pounce right on top of you. He is definitely the most vocal animal I've ever had or known. He'll cry when he's trying to tell you something and do little barks when he is excited. It's one of my favorite things about him. Murph man, we love you so very much. We love seeing up jump in the window, toy stuffed in your mouth when he pull into the drive way and I love walking down the hall in the morning to the guest room and see you snuggled so sweetly on the bed. You make all of our days a little brighter and certainly keep us on our toys. Here's to many, many more birthday little man. Hi friends! It's a cold, cold day in Columbia. I'm frozen just thinking about how cold it is out there. Tonight is movie night in the Colvin casa and I can't wait to get our fire going, blankets strewn all over the couch and cuddled next to my husband, while Murphy is sure to be tucked sweetly and warmly into his little bed. This weekend was a good one for my soul. I didn't have to spend much time at work, Josh and I spent a lot of quality time together, things around my house got done, our fireplace was running and movies were watched. It was a great weekend. Having time to enjoy my weekend and take a breather is somewhat of a new concept for me since I've started my new job. Being in the event industry, the hours are long and the days are short, seriously. Most weekends are spent at work and many weeknights are spent there too. This weekend made me realize with the holidays upon us, family to visit and many events taking place at work, I have got to be intentional with my time or I won't enjoy this season. I haven't gone too much in depth here in this space about my new job, but it's a lot of fun...but very tiring and a lot of hours. Sometimes I get to the end of a week and realize that I may have gotten to spend an hour of uninterrupted time with Josh that week. This holiday season, my prayer for myself is that I'll be intentional with my time and make it well spent. I love the holidays, I love spending time with my family, and I love the joy and cheerfulness this season brings. And just because I'm in a new job that keeps me running a million miles an hour , I don't want to forget where I enjoy spending my time most, and that is gathered with friends and family. I'm looking forward to Thanksgiving, Friendsgiving, Christmas shopping, Christmas decorating, cuddles by the fire, hot chocolate, Christmas lights, good food and good time with friends and family. In an effort to spend my time wisely, I've made myself weekly lists with attainable goals of things I need to do around the house, bills to get in the mail, time I want to spend with family and friends and I truly believe that seeing it all in front of me AND having "quality time with such and such this week" will keep me accountable and help me to be intentional with my time. Happy Monday, friends! I'm back from a weekend spent in the mountains with our youth group. Josh and I tackled our first trip as youth directors this weekend with our youth's annual fall retreat to Asbury Hills and I think it's safe to say that a good time was had by all. This weekend was just what I needed. A step away from real life and reality and step into God's beautiful creation, with a fantastic group of youth, my husband, and no cell service. Is it time to go back yet? This weekend laughs were abundant, tears we cried, disappointments were shared, raw and honest testimonies were shared and the Lord was at every turn. My heart was at such peace this weekend. And I hope our youth felt that way too. We couldn't have asked for better weather this weekend we hit the mountains at just the right time because all of the leaves were changing and the views were nothing short of stunning. As I said, this was our first trip as youth directors and I am so thankful for the time we got to spend with our guys and girls this weekend. It was such a great opportunity for our friendships to grow, to learn more about them and to connect with them on a different level. I never knew that the Lord had plans to lead Josh and I into youth ministry, but after this weekend, I can fully say that I'm so glad that He did. In an effort to be very transparent, planning for this trip was daunting. Between lining up a van, securing a cabin, getting permissions slips signed and turned in, to planning every program that took place this past weekend, it was tiring just planning the trip. But once we got there and everything began to fall into place, I was at such ease and peace, knowing that the Lord was in control and that the weekend would be better than we could have even imagined. My eyes, heart and mind were opened to situations going on in my life and situations going on in the lives of my youth this weekend. We took a night hike and ended up on the dam overlooking the lake and we all laid down and talked to God. Without words even being spoken out loud, I knew the Lord was moving in the hearts of those youth. I was honored to cry alongside and pray alongside all of them. We all have so much junk in our lives that sometimes we just need to rid ourselves of, and this weekend was the perfect opportunity to do so. In one of my prayers this weekend, I urged the youth (and myself and Josh included) to find God wherever they are. Whether that's kneeling at the foot of the cross or whether that's at the end of a long, scary road, with the cross barely in sight. Wherever our journeys are at this point and time, God will meet us there. He knows our needs, wants, desires, successes, failures, and sins...and He is there to grant us everything we need and give us grace when we need it most. Sitting at my desk this morning, I'm longing to be back in the mountains with that group. Reality is hard, for everyone. But I'm so thankful to have people to go through life with that are encouraging and prayerful...and I pray that our youth group knows just how much we love them and how often we cover them in prayer. When we first got this job, someone told me that before I knew it I'd love these kids like they were my own, and I absolutely do....I absolutely do. Our church had their very first trunk or treat this past weekend and we had the best time participating and there was such a great turn out! Everyone's cars looked awesome and the kiddos, oh my goodness, they were all dressed so cute and so sweet when they came up saying "trunk or treat...taaaaaank you". Too cute. Speaking of Murphy, he did such a great job at the trunk or treat and he left his costume alone and didn't try to pull his cape off, ha! We decorated our trunk with things off of our front porch (ha!) and then hit up the Dollar Tree for candy the rest of the decorations. I thought the car turned out really well and we had a lot of fun decorating. Although we live in somewhat of a neighborhood, our neighbors are mainly older folks and last year we didn't get any trick or treaters, so I'm really glad we got to participate in Halloween with some kiddos this year. And there's something about spending a beautiful October evening having a good time with your church family that just makes you feel good!